Warning: this post is for chocoholics. If you are not a chocoholic then you may want to go on your merry way until I get around to my next post about something that isn’t about chocolate. It might be a while. 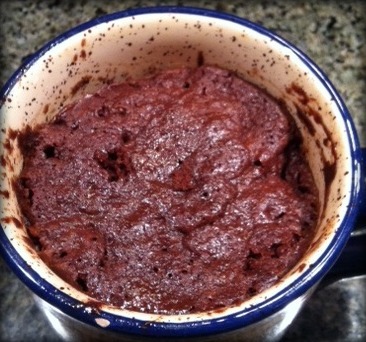 A few weeks ago my husband sent me a link to a microwaveable mug cake recipe that he wanted me to make. This is unusual because, generally speaking, he doesn’t like me to bake. I mean, he likes baked goods as much as you and I (well, maybe not as much as I) but he’s trying to lose weight. I, on the other hand, am watching my weight . . . watching it stay the same. We’re not going to talk about that right now. Moving on. So this past Friday night the boys were asleep (or in bed, at least) and the hubby went outside to smoke a cigar (deplorable habit) and I wanted a little something. Just something dessert-like. With chocolate, of course. IT’S NOT DESSERT UNLESS IT’S MADE WITH CHOCOLATE. Then I remembered the mug cake recipe! Excellent idea. Microwaveable so super easy, right? I tracked down the recipe in my email inbox and quickly skimmed the ingredients list. Whoa, what’s self-rising flour? Seriously, I have to buy a special flour? Time to do some Googling. I was happy to find out that it’s super easy to make self-rising flour. Essentially for each cup of all-purpose flour you just need to add 1 1/2 teaspoons of baking powder and 1/2 teaspoon of salt and then mix together. Easy-peasy lemon squeezey. I made a cup of it and stored it in my pantry for future mug cakes. I didn’t have Nutella (or Justin’s Nut Butter which, according to my friend Joni, is even better than Nutella and possibly better for you) so I ran to the store. At 10:30 at night in my comfy clothes. Needless to say, MUST.HAVE.CHOCOLATE. prevailed. No Justin’s Nut Butter in my local Albertson’s so I picked up the Nutella and some whipped cream. Normally I make whipped cream from scratch but I was trying to make things simple and quick so I got a can. 10 minutes later I was sitting on my sofa, turning on House Hunters International and eating chocolate cake out of a mug. Combine all ingredients in a large coffee mug (the large part is IMPORANT. Think gigantor latte cup.) Whisk well with a fork until smooth. Microwave on high for 1 1/2 – 3 minutes. Time depends on microwave wattage. (Mine took 1 minute, 40 seconds). If you cook it too long it will be dry. The top should look kind of wet but if you stick a toothpick in (or a finger, like me) then it should be cake-like inside. 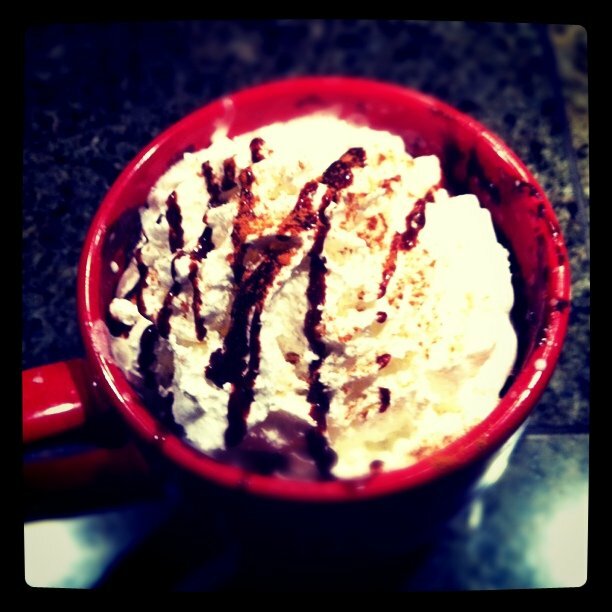 I topped with whipped cream, chocolate syrup & a sprinkle of cinnamon. I have a suspicion that warm, soft caramel drizzled on top of the cake and then topped with whipped cream would be freakin’ fantastic. Mmm. Let’s just pause and think about that for a minute. Mmm-hmm. The recipe makes 1 very large serving. This is a perfect shared dessert with your honey if you are feeling all romantical. If your honey is being a butthead then DO NOT SHARE. This is serious stuff, man. I luuuurve chocolate but I could only eat about half and then put the rest in the fridge for the hubby the next day. (Yes, the next day. Due to the previous butthead note. So on Saturday morning I told him what I had made and he bee-lined for the fridge. He ate half of it cold but I think it was even better after I warmed it in the microwave for 30 seconds or so). It doesn’t have a real Nutella flavor that I could detect. I wonder if playing with the amount of Nutella, or changing when the Nutella is added (like after it’s all mixed up, or mid-cooking process) would provide more of that hazelnut flavor. Hmmm, if you try any variations please let me know. (I should note that neither Nutella, Justin’s Nut Butter nor Albertson’s knows me and I’m not endorsing any particular product or business. Except for chocolate. We are tight like whoa). Go for Justin’s! We have 7g of sugar per serving compared to Nutella’s whopping 22g!!! Yikes that more than 17g in cake frosting! You can find the store locator on our website.